I’m rerunning this post from last year; it’s just so darn timely. Three families, living under one roof, compete over preparations for a three-day yontif, let’s call it, Sukkot. One bathtub, one shower, for twelve to twenty people. Each family is given a different budget. Within that budget, they must decorate a standard 10″ x 12″ canvas Sukkah, buy the children new clothes, as well as buy enough food for six four-course feasts. The food must be pleasing to the eye, varied, and delicious. Points taken away for families who serve on paper. All preparations must take place during the four days following Yom Kippur. Contestants: Let’s mix it up. One rich family with lots of help, one poor family with lots of kids, maybe an Israeli family that only observes one day. Let’s throw some wrenches into it! How about the meat delivery that doesn’t show up until the day of the holiday, then left by the delivery man outside the garage door overnight? A freak hurricane, leaving inches of water in the basement that your whole out-of-town family is supposed to sleep in! How about the poopy diaper that needs changing just as the mother has her hands plunged elbow-deep in a vat of slimy meat, in the throes of making stuffed cabbage? The bored children who bicker and leave wrappers, shoes and Wii games around the TV, although their mother needs help vacuuming, laundering, polishing, ironing, and cooking? The child who announces that he has lice, just as the mother comes home from that last trip to the store! Or the child who cuts himself badly enough for stitches, and must be rushed to the ER, seven hours before sundown! So many possibilities. Other challenges: the emergency trip to Amazing Savings for more aluminum pans, only to find that there aren’t any standard-size lasagna pans left. 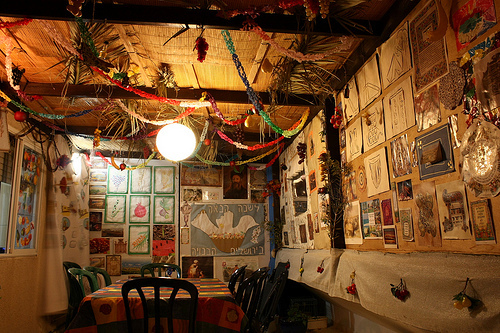 The rainstorm that destroys one Sukkah’s exquisite, hand-crafted decorations and blows the walls out of a second one. The cleaning lady who quits the day before the holiday. The college-aged daughter who brings a friend home for the holiday, a friend who only eats Satmar schita meat, cholov Yisroel milk, no gluten, and no nuts. Laughs ensue when the sleep-deprived mother has a mental breakdown from all the nonstop shopping, cooking, cleaning, mediating, scouring, soothing and serving, after surviving thirteen of these feasts in the previous two weeks. What’s great about this show is its portability; I envision a Three-Day Yontif Teaneck, Three-Day Yontif Five Towns, Three-Day Yontif LA, Three-Day Yontif Sephardi Style. Who would the judges be? The in-laws, of course! That’s the beauty of this game show. No one ever wins. What are your ideas for challenges? Ooh! Excellent twist. Full-time working mother has to do all this pre-yontiff stuff between, say, six p.m. and two a.m.
6pm? surely you jest! what mother has all her kids asleep or out of her way by 6pm??? more like 9pm – 3 or 4am! I was thinking of the time she gets home from work. I’m visualizing her trying to get a cranberry-oatmeal kugel in the oven, serving dinner, and helping the second-grader with homework, all at the same time. Just call it what it is: “The Real Housewives of [fill in the orthodox neighborhood].” Bravo-TV, are you reading this? Oy, the revenue! The shuls could pay their operating expenses years in advance! Thanks, Helen. This is great! Ha! Awesome. I think this show could really work in Israel…and then make its way here!